← Saturday 1st August 2015 – Come on let’s eat outside!! Sunday 2nd August 2015 – My King Edward’s are all harvested. Today started like most Sunday mornings do with breakfast. But instead of having it inside in the dining room we had it outside in the garden and under the gazebo. It was lovely and warm even for 8.30am. Why waste the gorgeous weather and the gazebo being up!!! Then after bell ringing this morning I popped to the allotment for a couple of hours. I’ve emptied the compost heap at home, and the contents in wonderful so I’m moving the contents to the allotment to fill up some tyres where I’m going to plant some strawberry runners that have decided to grow in the wrong place. It’s a rather slow process, but seems to be working. Once that was done I then had a container so I dug up all my King Edward Potatoes. 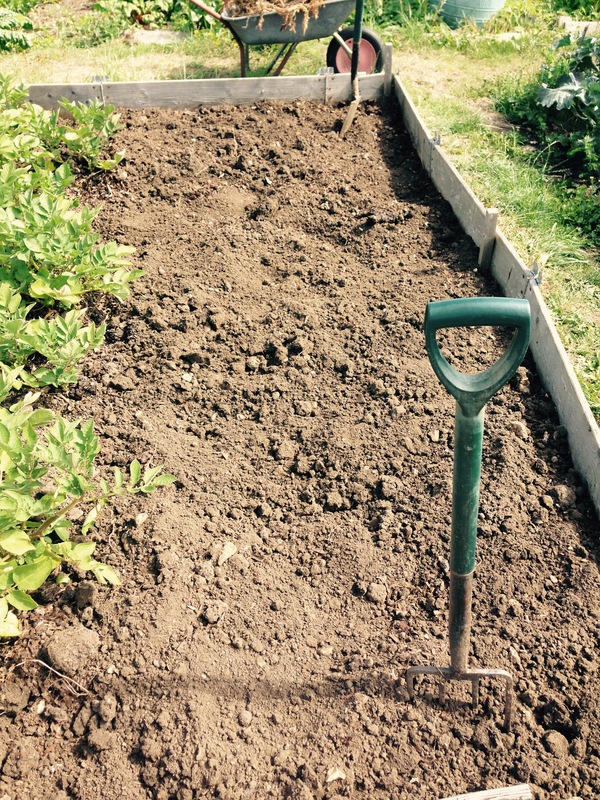 The soil is really dry, even thought I’ve been watering it often, but we’ve hardly had any rain (except those 2 days last week) so the only way to get up all the potatoes is to use a spade. Fortunately I manage not to slice any potatoes in half which was good. I think I managed to get up every single one, but I’ll only know for sure next spring when they start to grow again. I always miss some, I think we all do. When I got home it was time for lunch, again in the garden which was wonderful. Then we went to he cinema to see “Inside Out”. What a brilliant movie, so funny and not just for little kids. Teenagers and grown up will thoroughly enjoy it as well. We all did. We had planned to have dinner outside as well, but the flying ants decided that they would start to swarm, so we decided the most sensible thing to do would be to have dinner inside. The chickens did get very excited when the ants started to swarm so I let them out for a treat on the grass to peck at some. They didn’t hang about and gobbled up loads in a very short time. 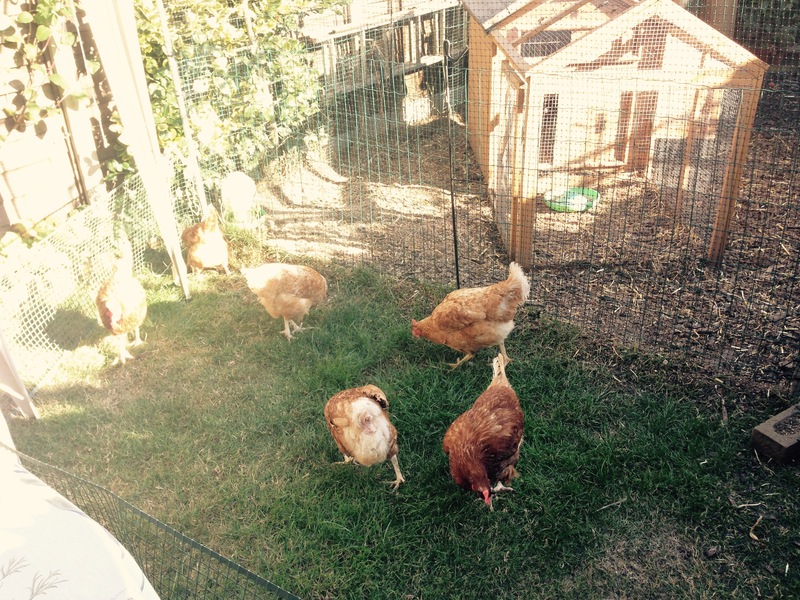 That’s my girls, pecking up all those pesky flying ants. Later on there was a bit of a kerfuffle, because a pigeon had landed on the grass near the chickens. There was a lot of wings flapping and clucking. The pigeon panicked and flew into the chickens run, and panicked some more, but then found it’s way out and flew away. Everyone then calmed down and order was resorted. The chickens don’t like to share their space with strangers. This entry was posted in Uncategorized and tagged claire's allotment, Disney, flying ants, Inside Out, King Edward potatoes, Pixar, potatoes, strawberries. Bookmark the permalink.